This 19th century Victorian home and its 1925 guest cottage on Five Mile River Road in Darien are being sold together. 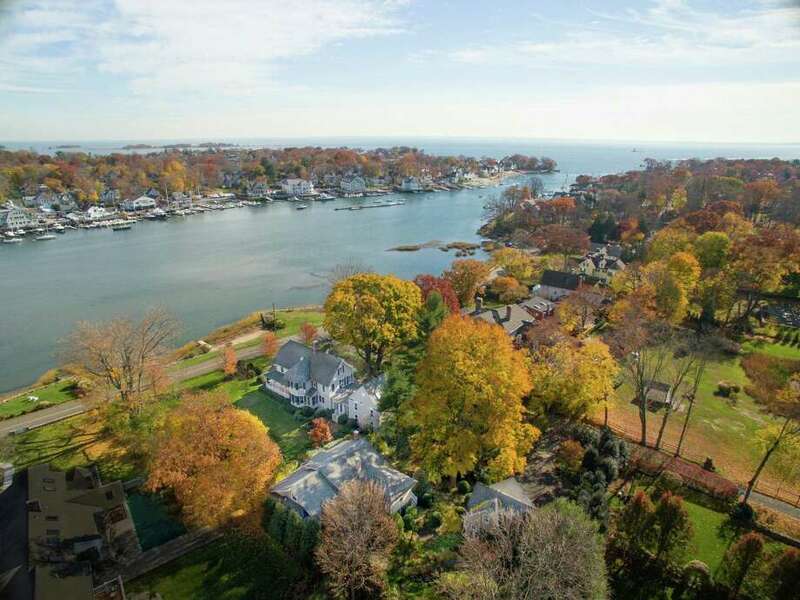 With a rare opportunity to own two waterfront homes in Darien, 108 and 110 Five Mile River Road offer buyers two lovingly restored properties on a coveted seaside address. Sited on 0.54 acres alongside Five Mile River, a 19th century Victorian home and its charming 1925 guest cottage are to be sold together. The quiet seaside locale on Five Mile offers buyers their own coastal New England oasis with year-round panoramic water vistas for shorebirds, boating and the village of Rowayton. A wrought iron fence, winding brick walkways and professionally landscaped gardens that have appeared in several home design magazines, surrounds the half-acre property. Built in 1886, the main property was a Victorian Sea Captain’s home, lovingly restored by previous owners with extensive wood details inside and out with 9-foot ceilings and antique pine flooring throughout. The five-bedroom Victorian features a wraparound front porch with detailed corbels just waiting for a pair of rocking chairs to enjoy the easy breeze off the river. * Denotes total of main house and guest cottage combined. A charming vestibule features antique double doors with an intricate glass design in keeping with the period and style of the home. Just off the foyer is a formal living room offering a quiet space to enjoy coveted water views of Five Mile River. The sitting room opens into a second living space, this one featuring a corner wood-burning fireplace with elegant moldings and a bay window with original windows complete with their original hardware. A charming formal dining room is lined with sea grass-inspired carpet, offer a nod to the home’s seaside locale. The dining room features a wood-burning fireplace, beadboard paneling and five original windows that bring in plenty of soft natural light. A light-filled eat-in kitchen features Carrara marble counters with a stainless steel island, white floor-to-ceiling cabinetry and two walk-in pantries. Appliances include a Subzero refrigerator, two Thermador wall ovens and a Miele dishwasher. A coastal-inspired powder room has been painted with soothing blue and white stripes and features a Carrara marble vanity with a hammered nickel sink. The first floor also includes a sunny office with an entire wall of windows French doors that lead to a brick terrace. Just off the back stairs is a large family room with vaulted ceilings, a built-in window bench and an entire wall of built-in bookcases. The second floor of the home includes two guest bedrooms that share a full hall bath, an office space with its own walk-in closet and full bath and a spacious master bedroom. With sitting room overlooking the water and an en suite bath, the master is a Victorian retreat. A third level includes a large study area and two additional bedrooms that share a full hall bath with a skylight. The main house and guest cottage are connected by stone paths the wind through the by professionally landscaped gardens. The charming guest cottage complete with a covered front porch was built in 1925. The cottage features a living room with a fireplace, an eat-in kitchen and three guest bedrooms that share two and a half baths. For more information or to see the property please contact Janet Olmstead of Halstead Property at 203-554-4022 or email her at janet.olmsted@gmail.com.